The Wall is not being built on, or in most cases near the 1967 Green Line, but rather cuts deep into the West Bank, expanding Israel’s theft of Palestinian land and resources. In total, 85% of the Wall is located in the West Bank. When completed, the Wall and its associated regime will de facto annex some 46% of the West Bank, isolating communities into Bantustans, ghettos and “military zones”. This means that the Palestinian population in the West Bank and Gaza Strip, including almost 1.5 million refugees, will be encircled on only 12% of mandate Palestine. Some 12% of Palestinians in the West Bank will be living in the closed military zone of the Jordan Valley or surrounded on three or four sides by the Wall or isolated between it and the green line. They face increasingly unbearable living conditions - the loss of land, markets, movement and livelihoods - and many will face expulsion. This includes over 200,000 Palestinians of East Jerusalem, who will be totally isolated from the rest of the West Bank. 98% of the settler population will be included in the de facto annexed areas. The Wall is not a new “idea” - since 1994 the Gaza Strip has been surrounded by a barrier that cuts off Palestinians there from the rest of the world. In November 2000 Israeli Prime Minister Barak (Labour Party) approved the first project to build a “barrier”. 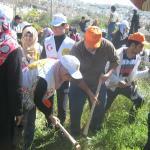 Construction of the Wall, including land confiscation and the uprooting of trees, began in June 2002 west of Jenin. As of summer 2010, 520 km of the planned 810 km, or 64%, had been completed. Wall construction was slow for most of 2010 as a result of worries about the financial crisis and ongoing court cases. Instead of building new portions of the Wall, work focused on modifications in the areas of Bil’in, Jayyus and around Jerusalem. In the latter half of 2010, there was renewed work in Jerusalem where the focus was on closing gaps in certain areas. 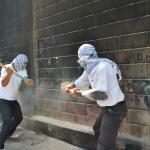 In Bethlehem, Wall construction has restarted in al Walaja village, where the village will be surrounded on all sides. Work is also ongoing in Beit Jala, where the Wall is being built along a settler road. The Jordan Valley remains almost completely isolated from the rest of the West Bank as a closed military zone. According to Israeli military officials, the Wall’s total length will be some 810 km. The cost of the Wall is now estimated at $2.1 billion, and each km costs approximately $2 million. In addition, the Occupation has spent 2 billion shekels to construct alternative roads and tunnels. 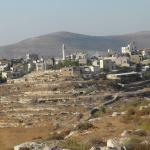 Villages surrounded by Wall, settlements and settler roads - 257,265 Palestinians. 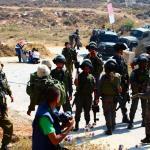 Villages isolated and residents threatened with expulsion - 6,314 Palestinians. The so-called “disengagement”, “modifications”, “convergence” and “development” are all part of the Israeli rhetoric that hides the overall strategy for the complete colonization of the West Bank and the expulsion or enslavement of the Palestinian population. The “modification” of the path of the Wall, far from being a benefit for the local population, often only returns a fraction of what was stolen. It also serves to distract from the ICJ ruling, which calls for the dismantling of the Wall, not the rerouting of small sections. In addition, these modifications often ensure that the lands that remain isolated behind the Wall cannot be accessed by their owners, effectively annexing them. Instead of dismantling settlements, the Occupation continues to expand them, in particular those located around Jerusalem and Bethlehem. The concrete Wall is present in Bethlehem, parts of Ramallah, Qalqilya, parts of Tulkarm and throughout the Jerusalem envelope. It is 8 meters high - twice the height of the Berlin Wall - with watchtowers and a “buffer zone” 30-100 meters wide for electric fences, trenches, cameras, sensors, and military patrols. In other places, the Wall consists of layers of fencing and razor wire, military patrol roads, sand paths to trace footprints, ditches and surveillance cameras. The Apartheid Wall’s “buffer zone” paves the way for large-scale demolitions and the expulsion of nearby residents, as in many places the Wall is located just meters away from homes, shops, and schools. The land between the Apartheid Wall and the Green Line has been declared a “seam zone”, and all residents and landowners in this area must obtain a permit to remain in their homes and on their lands. 34 fortified checkpoints - 3 main terminals, 9 commercial terminals, and 22 terminals for cars and workers that control all Palestinian movement. 44 tunnels will connect 22 small ghettos inside 3 main ghettos. 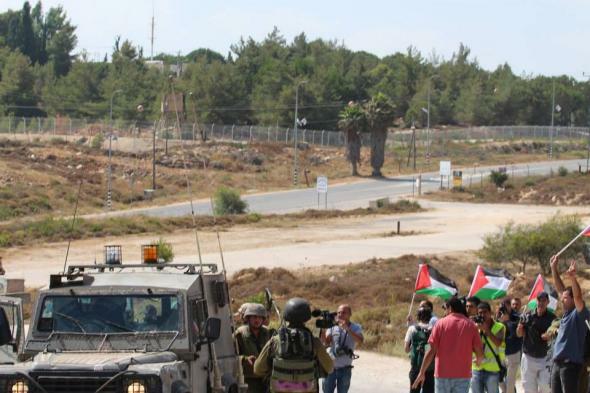 634 checkpoints or other military obstructions including trenches, roadblocks, metal gates under Occupation control. 1,661 km of settler roads connect settlements and settlement blocs and complement the Wall system. The ghettoization project in all of its forms imprisons the Palestinian population and, in many places, isolates it from basic services. This, along with the loss of land, markets, and resources, results in the inability of communities to sustain themselves adequately and with dignity. The northwestern part from Jenin to Qalqiliya (the “first phase” of 145 km) is complete while continuing south until Salfit. From there it merges with the other portion of the Wall to form a ghetto in the north. Within the “first phase”, 13 villages west of the Wall have been de facto annexed to Israel and some 50 villages are separated from their lands. 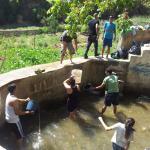 Also in the “first phase”, Israel has confiscated 36 groundwater wells and at least another 14 wells are threatened with demolition in the Wall’s “buffer zone”. 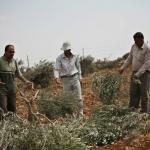 Salfit, the most fertile area of the West Bank known as the “food basket”, will lose more than 50% of its land – isolated behind the Apartheid Wall. North of Salfit, the Ariel settlement bloc cuts into 22km of the West Bank, separating the Central Ghetto from the North. This annexes 2% of the West Bank. The Wall winds 22km into the West Bank to annex the settlement blocs creating two fingers: Immanuel and Ariel. The route of the two creates small, isolated Palestinian ghettos. Communities like ‘Izbat Abu Adam, Dar Abu Basal and Wadi Qana are isolated inside the settlement blocs themselves. Another three villages, Az Zawiya, Deir Ballut and Rafat, east of the Ariel Finger, are to be surrounded on four sides by the Wall and connected to the reset of the West Bank by tunnel. More than a dozen villages located along the route of the Wall will collectively lose thousands of dunums of productive land. The Wall encircles the Holy City and the ring of settler colonies around it, furthering Jerusalem’s isolation from the West Bank. The Wall rips through villages and neighborhoods, separating families, cutting social and economic ties, and ghettoizing areas stolen by the Zionist project in its plans for Jerusalem as the future capital of Israel. New settlements are under construction around Jerusalem built on the annexed lands. 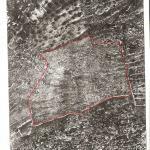 This seeks to enlarge the number of Jewish settlers in the area in the project to change the city’s demography. Some 25 villages and neighbourhoods will be completely isolated from the rest of Jerusalem and the West Bank and squeezed into five different ghettos. The Wall in Jerusalem is almost completed. Only small parts in the north and east of the city are still under construction. The Jerusalem district will, in total, lose 90% of its land when the Wall is completed. It is a central component of the plan to ethnically cleanse Palestinians from Jerusalem. The right of Palestinians to live in Jerusalem is also under threat, and of the 396 Palestinian structures that were demolished by Israeli forces in 2010, many were located in Jerusalem. In the southern West Bank the Apartheid Wall encircles Bethlehem by continuing south of East Jerusalem in both the east and west. With the land isolated by the Wall, annexed for settlements, and closed under various pretexts, only 13% of the Bethlehem district is available for Palestinian use. In Bethlehem and Hebron concrete walls surround the main holy sites, Rachel’s Tomb and Abraham’s Mosque respectively. Rachel’s Tomb is already inaccessible to Palestinians and is being annexed. 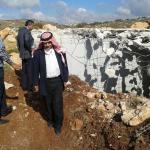 The Wall isolates thousands of dunums from Hebron district, threatening cattle rearing, which is a main of source livelihood in the area. Since 2000 the Valley has been surrounded with 6 checkpoints controlling all access. The Occupation announced in February 2006 a plan to annex 28.5% of the Valley, including 24 villages with a population of 52,000 along with their water resources and the Eastern aquifer. 200,000 people living in the Tubas and Nablus regions who own land or have family in the Jordan Valley are denied access. The Gaza Strip, with a population of some 1.5 million people in 365 km2 is one of the most densely populated places on the globe. It is a prison that has been completely surrounded for years by walls and razor wire. 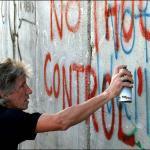 The Wall in Gaza extends to about 55 kilometers starting from northwest of Beit Lahia until southeast of Rafah. Along the Wall runs a “buffer zone” which ranges, since the Gaza assault, between 300 – 600 meters. Anyone approaching the buffer zone runs the risk of being shot. The consequences of the buffer zone have been severe. 25% of the most fertile agricultural lands in Gaza are not useable. 15% of Gaza farmers are deprived of work, joining the ranks of the unemployed and becoming dependent on the food aid. Popular resistance to the Wall, which consists of demonstrations and various means of direct action, began with the first demolitions in 2002 and has continued ever since. Repression by Israeli forces has been severe. There have been 16 people killed in demonstrations against the Wall, half of them under 18. Thousands more have been injured, and hundreds arrested. From 2008 – 2009 in the village of Ni’lin, for instance, nearly 500 were injured by Israeli fire, and more than 70 were arrested. The first wave of killings and serious repression lasted for a year and began in 2004 with the killing of 5 people in Biddu, which had organized mass demonstrations against the construction of the Wall. In 2005, 3 children were shot dead in Beit Liqya. A similar wave of killings occurred during 2008-2009, when Occupation forces killed 5 in Ni’lin and 1 in Bil’in, again in response to ongoing resistance. Repression continued in 2010, and arrests in villages protesting the Wall increased. This is not to say that violence disappeared; protestors are continually beaten and injured by projectiles at demonstrations. In March 2010, soldiers shot and killed Mohammed Abdelqader Qadus (16) and Usaid Abd Qadus (19) in the village of Iraq Burin. 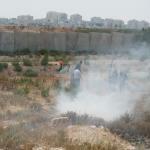 The village had been holding weekly demonstrations in protest of settler violence and land confiscation. 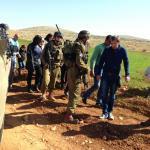 Arrests related to actions against the Wall and settlements continued to increase. From our grassroots committees and local human rights NGOs, there has been an estimated 250 arrests of human rights defenders (HRDs) in response to actions against the Wall and settlements. This number does not include Jerusalem, where an estimated 750 Palestinians, many of them minors, were arrested in 2010. Despite this repression, grassroots action against the Wall and settlements continue to expand across the West Bank. 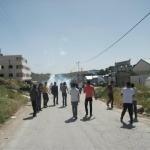 Friday protests continued in the villages of Bil’in, al Ma’sara and Ni’lin as well as the Saturday protests in Beit Ummar. 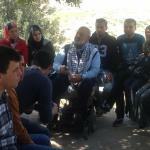 The weekly protest in an Nabi Saleh, which began a year ago, remains strong. Marches against the checkpoint in Beitin, the Wall in al Walaja and Beit Jala have also been organized, in addition to the protests against the settlements that were also occurring every Saturday in Iraq Burkin and more recently in the old city of Hebron. These demonstrations are costly for Occupation forces. During the trial of Abdallah Abu Rahmah, documents presented revealed that ammunition used against demonstrations from August 2008 – 2009 cost 6.5 million NIS (1.83 USD), and the concrete wall erected in Ni’lin, a response to the continued cutting of the fence, cost 8.5 million NIS (2.39 USD). Despite the pretense of international political pressure, settlement expansion continued in 2010, with a considerable amount of activity taking place in and around Jerusalem. In January, 600 new settlement units were approved in East Jerusalem in the settlement of Pisgat Ze’ev and around the Palestinian neighborhood of Shu’afat. This was followed in March by the approval of 1600 housing in Ramat Shlomo, north of Jerusalem, as well as 1300 units in Pisgat Ze’ev, Neve Yakoov, and Har Homa. Construction on many of the buildings in Pisgat Ze’ev and Neve Yakoov began or reached various stages of approval throughout the year. 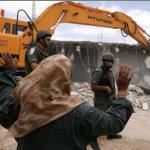 In April, the Occupation municipality approved 321 settlement units in the Sheikh Jarrah neighborhood. New homes for settlers were built around Bethlehem, where Occupation authorities are also in the process of continuing Wall construction. 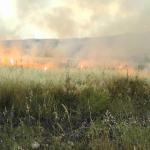 In March 112 settlement units were authorized for construction in Betar Illit, while in June construction on 100 units began near Beit Jala and al Walajah. At the end of the year, a plan to build 90 housing units in the Gilo settlement was approved. Settlement activity continued in other areas of the West Bank as well. According to the PNA, during the first half of 2010, 1135 housing units were built, 339 in East Jerusalem and remainder in other parts of the West Bank. 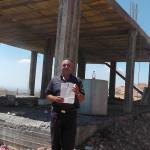 Also in the first half of 2010, 3009 settlement residential units were under construction, 1029 in the West Bank. More construction is planned, and media reports in June reported settler councils planned to build 2,700 new housing units, many in the northern West Bank. Other reports in September revealed that 12,000 housing units were planned for East Jerusalem settlements, and that 50,000 more new housing units were in various stages of planning, approval or construction through the remainder of the West Bank. Settler violence against Palestinians also increased in 2010, with more than 300 “incidents” recorded by UN OCHA. Of these, 205 related to attacks and damage of property by settlers. In 108 cases settlers attacked and wounded Palestinians. 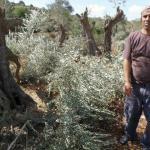 As has been the case in past years, attacks intensified during the yearly olive harvest, in particular in villages around Nablus, where Palestinian residents faced dozens of settler attacks. 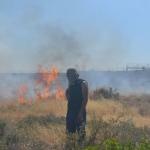 Beit Jala Protest 30 August 1. تل أبيب 29-4-2014 وفا- أفادت صحيفة 'هآرتس' الإسرائيلية في عددها الصادر اليوم الثلاثاء، بأن الإدارة المدنية' للاحتلال أعلنت عن الاستيلاء على 28 ألف دونم للبناء في مستوطنات الضفة الغربية، في مناطق صنفت بأنها 'استراتيجية'. وأوضحت الصحيفة، أن قائد الإدارة المدنية للاحتلال يواب مردخي شارك يوم أمس الاثنين، في جلسة للجنة الفرعية' ليهودا والسامرة ' في لجنة الخارجية والأمن في الكنيست الإسرائيلي، لبحث تطبيق قانون الإدارة المدنية على الفلسطينيين. شهد شهر كانون الثاني للعام 2014، مزيداً من جرائم المستوطنين المستمرة ضد الفلسطينيين وممتلكاتهم، الى جانب الكشف عن مزيد من خطط التوسع الاستيطاني التي صادقت عليها حكومة الاحتلال. 15\11\2013 نجحت مجموعة من نشطاء المقاومة الشعبية فجر يوم الجمعة، بهدم مقطع من الجدار الإسمنتي ما يشكل حوالي عشرة أمتار بالقرب من بلدة بير نبالا شمال غرب القدس، وقد عبر العشرات من المشاركين من الفتحة التي تم إحداثها في الجدار إلى الجهة الأخرى من الجدار التي توصل إلى مدينة القدس. 9\10\2013 نفذت الحملة الشعبية لمقاومة الجدار والاستيطان واتحاد المزارعين والجمعية التعاونية لكفر اللبد أمس الثلاثاء، وضمن حملة "لستم وحدكم" فعالياتها لمساندة الأهالي في قطف الزيتون في كل من كفر اللبد في محافظة طولكرم وقرية بروقين في محافظة سلفيت. تمارس حكومة الاحتلال عملية التطهير العرقي في الاراضي الفلسطينية على مرأى ومسمع من العالم، وتشهد الاراضي الفلسطينية عمليات توسع استيطاني شرس وعمليات مصادرة للاراضي الى جانب اعتداءات يومية من قبل جيش الاحتلال ومستوطنيه على المواطنين الفلسطينيين وممتلكاتهم. ووفقاً للمخططات الهيكلية للمستوطنات، فإنها تسيطر على مساحة تبلغ نحو 485 كيلو متراً مربعاً، ما يشكل ما نسبته 8.5% من مساحة الضفة (5760 كم مربع). اختتمت الحملة الشعبية لمقاومة الجدار والاستيطان ولجان المقاومة الشعبية، سلسلة الفعاليات المناهضة للجدار والاستيطان والتي جاءت تزامناً مع الذكرى التاسعة لفتوى لاهاي. وكانت أولى الفعاليات قد نفذت الاربعاء الماضي 3-7-2013 عندما قام أكثر من 150 مشارك باستصلاح أراضي مصادرة في قرية بيتين، لصالح مستوطنة "بيت إيل"، وقد قمعت قوات الاحتلال المتظاهرين باطلاق الأعيرة المطاطية وقنابل الغاز والصوت باتجاههم. 3-7-2013 أطلقت لجان وفعاليات المقاومة الشعبية، سلسلة فعاليات مناهضة للجدار والاستيطان انطلقت من قرية بيتين شرق رام الله، حيث شارك أكثر من 150 باستصلاح أراضي مصادرة لصالح مستوطنة "بيت إيل". وقد قمعت قوات الاحتلال الاسرائيلي المظاهرة باطلاق العيارات المطاطية وإطلاق كثيف لقنابل الغاز باتجاه المشاركين ما أدى الى اصابة عدد منهم. رام الله – 30/6/2013 – كشف التقرير الشهري الصادر عن مركز معلومات الجدار والاستيطان عن (98) اعتداء نفذتها قوات الاحتلال الاسرائيلي ومستوطنيه المتطرفين خلال شهر حزيران 2013. استمر المستوطنون القاطنون في أراضي الضفة الغربية المحتلة خلافاً للقانون الإنساني الدولي في اقتراف جرائمهم المنظمة ضد المدنيين الفلسطينيين وممتلكاتهم. 3\6\2013 قامت مجموعة من المستوطنين اليوم الاثنين، باضرام النار بأراض في قرية مأدما جنوب نابلس، وهي أراض زراعية تبلغ مساحتها 10 دونمات. كما قامت قوات الاحتلال بشن حملة تفتيش في قريتي اليامون وكفردان قضاء جنين، بحجة البحث عن آبار مياه، وكانت قوات الاحتلال قد أغلقت قبلاً عدد من الآبار يستخدمها المواطنون في القريتين لري أراضيهم الزراعية. 2-6-2013أخطرت قوات الاحتلال اليوم الأحد، مواطنين من قرية بروقين في محافظة سلفيت، باخلاء أكثر من 100 دونم، وكان رئيس بلدية بروقين نافذ بركات صاحب الارض والمواطن صلاح عامر ، قد وجدا الاخطار في أراضيهم في منطقة الشعاب شمال قرية بروقين.وكان السيد بركات قد استصلح أرضه قبل 4 أشهر وقام بزراعتها، ليجد اليوم اخطاراً من قبل جيش الاحتلال باخلائها. كما قامت مجموعة من المستوطنين باغلاق الشارع الرئيسي لقرية ياسوف في محافظة سلفيت، بعد ان قاموا بالاعتداء على مركبات المواطنين هناك. 15-5-2013 اعتقلت قوات الاحتلال الاسرائيلي أمس منسق الحملة الشعبية لمقاومة الجدار والاستيطان في محافظة بيت لحم مازن العزة، أثناء مشاركته بمسيرة العودة بمناسبة الذكرى ال 65 للنكبة، حيث فوجئ المشاركون وعند وصول المسيرة لما يسمى "حاجز 60" بتواجد كثيف لجيش الاحتلال هناك والذي قام بدوره بقمع المظاهرة وملاحقة المواطنين والاعتداء عليهم. المعصرة: قمعت قوات الاحتلال الإسرائيلي، مسيرة المعصرة الاسبوعية المنددة بجدار الضم العنصري والتوسع الاستيطاني. كما قام جنود الاحتلال باعتراض المسيرة واعتدوا على المتظاهرين بالضرب المبرح ومنعوهم من الوصول الى مكان الجدار، ما ادى الى اصابة عدد منهم . بيت أمر: أصيب عشرات المواطنين بالاختناق وثلاثة آخرين بالرصاص المعدني المغلف بالمطاط جراء إطلاق جنود الاحتلال القنابل الغزية والدخانية صوب الفتية المتظاهرين على مدخل قرية بيت أمر. استخدمت قوات الإحتلال اليوم الجمعة 29-3 قنابل الغاز المسيل للدموع وخراطيم المياه النتنة بكثافة لقمع المظاهرة الأسبوعية المطالبة بحرية الحركة في محافظة الخليل والمطالبة بفتح الشارع الموصل بين المدينة وبلدات السموع والظاهرية ودورا ومخيم الفوار والمغلق من قبل الاحتلال الاسرائيلي منذ حوالي 12 عاما وإحياء لذكرى يوم الأرض. نظمت الحملة الشعبية لمقاومة الجدار والاستيطان اليوم الخميس 28/3/2013 فعالية وطنية لإحياء يوم الارض على ارض قرية العقبة الغورية في محافظة طوباس، وذلك بمشاركة عشرات من شباب محافظة جنين. وقد استقبل الحاج سامي صادق رئيس مجلس قروي العقبة الوفد التضامني وشرح لهم عن معاناة القرية وحجم التحديات التي يواجهها سكان القرية والنضال القانوني لوقف الاعتداءات الاسرائيلية المستمرة على الارض والانسان في هذه المنطقة. الخليل 28/3/201 شارك العشرات من نشطاء الحملة الشعبية لمقاومة الجدار والاستيطان في فعالية زراعة اشجار وتنظيف لمقبرة شارع الشهداء الذي اغلقه الاحتلال الاسرائيلي ومستوطنيه بعد مجزرة الحرم الابراهيمي عام 1994 بالخليل المحتلة، وذلك ضمن الفعاليات التي تنظمها وتشارك بها الحملة الشعبية بمناسبة ذكرى يوم الارض. وأكد منسق الحملة الشعبية لمقاومة الجدار والاستيطان في الخليل يوسف طميزي ان الفعاليات ستستمر وستتصاعد في سبيل مقاومة الاحتلال وسياساته التوسعية. الاحد 10\3\2013 نظمت الحملة الشعبية وبالتعاون مع مؤسسات نسوية وأهالي قرى حبلة وعزون في محافظة قلقيلية، مظاهرة نسوية أمام بوابة حبلة، بمناسبة الثامن من آذار. وقد شارك حوالي 60 امرأة في المظاهرة رفعن فيها شعارات تطالب باسقاط الجدار، والافراج عن الاسرى والحرية لفلسطين، مؤكدين على أن الثمن من آذار هو رمز للحرية والنضال والعزيمة والاصرار ضد المحتل. هذا وقد أغلق جنود الاحتلال بوابة حبلة، والتي تفتح 3 مرات أسبوعياً فقط أمام المزارعين الفلسطينيين. نظمت الحملة الشعبية لمقاومة الجدار واتحاد المزارعين والائتلاف الشعبي للحق في الارض أمس الاحد 13/1/2013، وبمشاركة وفد من لجنة مقاطعة الصندوق القومي اليهودي واهالي خربة الطويل وبلدة عقربا، فعالية دعم وصمود لأهالي خربة الطويل المهددة بالتهجير. كفر قدوم: قمعت قوات الاحتلال الإسرائيلي، أمس الجمعة، مسيرة القرية المناهضة للاستيطان، والمطالبة بفتح المدخل الرئيس للقرية المغلق منذ أكثر من عقد، ما أدى لإصابة العشرات بحالات اختناق وإغماء نتيجة استنشاقهم الغاز السام المسيل للدموع. وشارك في المسيرة مئات المواطنين، إضافة إلى متضامنين أجانب مؤيدين لحقوق الشعب الفلسطيني في الحرية وإقامة الدولة، وردد المشاركون الشعارات الوطنية المناهضة لسياسة التوسع الاستيطاني التي تنتهجها حكومة اليمين الإسرائيلية المتطرفة. الخليل-معا- جرفت سلطات الاحتلال الاسرائيلي اليوم الاربعاء، قرابة 70 دونما وهدمت 3 ابار زراعية و3غرفة زراعية غرب بلدة بيت اولا غرب مدينة الخليل. النبي صالح: أصيب شابان ومتضامن أجنبي بالرصاص المطاطي، بعد قمع قوات الاحتلال الإسرائيلي مسيرة قرية النبي صالح شمال غرب رام الله المنددة بالاستيطان ومصادرة الأراضي ظهر الجمعة. كما اعتقلت قوات الاحتلال متضامنين، إلى جانب إصابة العشرات بحالات الاختناق، بعد قمع المسيرة التي حملت عنوان 'على درب الشهداء'، وفاء للشهيد رشدي التميمي، الذي استشهد على أرض القرية قبل عدة أيام، وللشهداء الذين سقطوا في العدوان الأخير على قطاع غزة. بيت لحم 9-11-2012-اعتقلت قوات الاحتلال الإسرائيلي، اليوم الجمعة، متضامنين أجنبيين، واعتدت على المشاركين في مسيرة نظمت على مفرق الطرق المؤدي إلى مجمع مستوطنة عصيون جنوب بيت لحم. وأفاد بريجية أن أعدادا كبيرة من المشاركين من جنوب الضفة الغربية، ومتضامنين أجانب شاركوا في هذه المسيرة، حيث تم إغلاق الطريق الرئيسي المؤدي إلى سجن عصيون ورفعت الأعلام الفلسطينية. وأضاف: إن مواجهات وتلاسن جرى بين المشاركين وعدد من المستوطنين وقوات الاحتلال التي قمعت المسيرة واعتدت على المشاركين فيها بالضرب، واعتقلت متضامنين أجنبيين. بيت لحم 8-11-2012 وفا- شرعت قوات الاحتلال الإسرائيلي ظهر اليوم الخميس، بقطع العشرات من أشجار الزيتون واللوزيات في أراضي قرية نحالين غرب بيت لحم. وأفاد رئيس مجلس قروي نحالين جمال نجاجرة لـــ'وفا' بأن عمالا وتحت حماية جنود الاحتلال يقومون بقطع أشجار الزيتون واللوزيات في منطقة عيد فارس جنوب غرب القرية المحاذية لمستوطنة 'بيتار عيليت' المقامة على أراضي قرى وادي فوكين ونحالين وحوسان بواسطة منشار. وأشار نجاجرة إلى أن أراضي نحالين تتعرض منذ فترة إلى هجمة استيطانية شرسة من قبل الاحتلال خاصة منطقة عين فارس التي وصلت إلى حد ضخ المياه العادمة فيها وإتلاف المزروعات. نابلس 7-11-2012 وفا- أقدم مستوطنون صباح اليوم الأربعاء، على اقتلاع نحو مائة شجرة زيتون من أراضي قرية الساوية جنوب نابلس بالضفة الغربية. وقال مسؤول ملف الاستيطان شمال الضفة غسان دغلس، إن الأشجار التي اقتلعها المستوطنون عمرها عشر سنوات، وتعود ملكيتها لكل من المواطنين: محمد صالح، وصالح جابي، ومصطفى العلي. وأضاف دغلس أن المستوطنين خطوا أيضا شعارات عنصرية في المكان، معتبرا ما أقدم عليه المستوطنون جريمة جديدة بحق أشجار الزيتون التي تتعرض إلى اعتداءات شبه يومية من قبل المستوطنين بدعم من جيش الاحتلال. يعيش الحاج خليل محمد مسلم نواجعة "85 عاما" الذي يسكن قرية سوسيا الفلسطينية، جنوب شرق يطا في حالة قلق دائم خشية من مهاجمة المستوطنين لأفراد أسرته، وخشية من قيام سلطات الإحتلال بهدم مساكنهم وترحيلهم من قريتهم. الخليل 26-8-2012 وفا- أخطرت سلطات الاحتلال الإسرائيلي، اليوم الأحد، مواطني وادي الغروس شرق مدينة الخليل بالاستيلاء على ما يزيد عن 7 دونمات من أراضيهم لشق طريق استيطاني يربط مستوطنتي 'خارصينا وكريات أربع' المقامتين على أراضي المواطنين في مدينة الخليل، بالبؤرة الاستيطانية 'شمورت اسحق'. ويقع في مستوطنة 'شمورت اسحق' سكن قوات ما يسمى 'حرس الحدود الإسرائيلي' وتستوطنها ما يقارب 20 عائلة من المستوطنين الذين يواصلون اعتداءاتهم على المواطنين وممتلكاتهم ومزروعاتهم بهدف إرغامهم على الرحيل. أفاد منسق الحملة الشعبية لمقاومة الجدار والاستيطان في بروقين في محافظة سلفيت، أن أعمال تجريف تجري في البؤرة الاستيطانية "بروخين" غرب القرية، وأخرى شمال شرق البلدة في المنطقة الصناعية "أرئيل غرب" بالتزامن، بغرض توسعة البؤرتين المقامتين على أراضي القرية. وأضاف أن اعمال التجريف التي تهدف لتوسعة "أرئيل غرب" تجري على أراضي المواطنين عبد الهادي سمارة وعبد الخالق صبرة، على أعلى الجبل والذي يحتوي على منطقة أثرية تدعى"كركش"، وأفاد أن أعمال التجريف باتت أقرب الى المنطقة. وجد المزارع مصطفى داوود عبد صوف من قرية حارس شمال سلفيت، أمراً عسكريا وضعته قوات الاحتلال في أرضه يقضي بإخلائها وإعادتها الى ما كانت عليه، مدعية أن الارض مصنفة كأملاك دولة وأمهلوه 45 يوم للاعتراض، علماً بأنه يملك كل الاوراق الثبوتية التي تثبت ملكيته للارض. قطعة الارض تقدر مساحتها ب 68 دونم ، وتقع الى الجهة الجنوبية الغربية من قرية حارس وهي محاطة بمنطقة بركان الصناعية ومنطقة حدائق "ارائيل" الاستيطانية وكذلك الشارع الاستيطاني المعروف بعابر السامرة. 22\8\2012سلمت قوات الاحتلال الاسرائيلي بعد ظهر اليوم الاربعاء، اخطارين بالهدم لمواطنين في بلدة بيت أمر، في منطقة شعب السير المحاذية لمستوطنة كرمي تسور، المقامة على أراضي البلدة. وسلمت وحدة مراقبة الأبنية والتنظيم التابعة للإدارة المدنية الإسرائيلية، ترافقها قوة عسكرية المواطن يونس عيسى عبد الحميد زعاقيق اخطاراً بهدم منزله قيد الإنشاء ومساحته 105 امتار مربعة، وقال زعاقيق انه يملك كافة الاثباتات الخاصة بالأرض وهي قطعة الأرض الوحيدة التي يملكها ويمكنه البناء فيها. تل أبيب 7-8-2012 وفا- اقرت اللجنة المالية التابعة للكنيست الإسرائيلي تحويل ملايين الشواقل الى المستوطنات. وذكرت صحيفة 'هارتس' العبرية، اليوم الثلاثاء، أن اللجنة أقرت تحويل مبلغ 8.3 مليون شاقل لنقل البؤرة الاستيطانية 'ميجرون' ، و 2.7 مليون شاقل للبنية التحتية في المستوطنات. وأضافت أن هذه اللجنة أقرت كذلك مبلغ 12.4 مليون شاقل للإدارة المدنية في المناطق المحتلة لزيادة عدد المفتشين على البناء غير المرخص في الأرض الفلسطينية. بيت لحم 5-8-2012 وفا- توسع قوات الاحتلال الإسرائيلي، اليوم الأحد، حدود مستوطنة 'نفي دانيال' المقامة على أراضي مواطنين من بلدة الخضر جنوب بيت لحم . 17-7-2012 قامت جرافة تابعة لقوات الاحتلال صباح اليوم، باقتلاع 30 شجرة زيتون عمرها قرابة الـ 15 سنة ومصادرتها في قرية قصرة قضاء نابلس، تعود ملكيتها للمواطنين محمد شحادة وصقر شحادة، وقد قامت في ذات الوقت بوضع اخطار بوقف العمل في أرض تابعة للمواطن فتح الله محمود "أبو هيثم" والقريبة من مستوطنة "مجدوليم". وشارك في المسيرة ما يزيد عن 120 متطوعاً محليا من كل انحاء الضفة الغربية والأراضي المحتلة عام 48 ومجموعة من المتضامنين الدوليين الذين عبروا عن استيائهم من اعتداءات المستوطنين على المنطقة ومخطط مصادرتها. 13-7-2012 نظمت الحملة الشعبية لمقاومة الجدار والاستيطان، يوم عمل تطوعي في البلدة القديمة في الخليل بمشاركة ما يزيد عن 200 متطوع من مخيم فرخة الدولي التاسع عشر للشباب، وبمشاركة متطوعي الحملة الشعبية في محافظة الخليل. 26\6\2012 قام حوالي 40 متطوع من الحملة الشعبية لمقاومة الجدار والاستيطان من قرى محافظة سلفيت، أمس الثلاثاء، بعمل تطوعي في واد قانا، قاموا خلاله بتنظيف أرض مساحتها 3 دونمات وهي الارض التي يستخدمها الأهالي عند زيارتهم للواد، كما قام المتطوعون بمساعدة مزارع بتنظيف أرضه وتهيأتها للزراعة، وأنهى المتطوعون النشاط التطوعي بجولة في الواد. يأتي هذا النشاط ضمن سلسلة نشاطات تطوعية ينفذها متطوعوا الحملة في محافظة سلفيت، تأكيداً على فلسطينية واد قانا ومساندة للأهالي هناك أمام ما يتعرض له الواد من اعتداءات ومصادرة من قبل جيش الاحتلال ومستوطنيه. بلعين: أصيب مواطن بجروح والعشرات من المواطنين ومتضامنين أجانب بالاختناق الشديد أثر استنشاقهم غازا مسيلا للدموع في مسيرة بلعين الأسبوعية المناهضة للاستيطان وجدار الفصل العنصري تحت شعار" المقاومة الشعبية مستمرة في بلعين". بلعين: أصيب اليوم الجمعة العشرات من المواطنين ومتضامنين أجانب بالاختناق الشديد أثر استنشاقهم غازا مسيلا للدموع في مسيرة بلعين الأسبوعية المناوئة للاستيطان وجدار الفصل العنصري واحتراق عشرات الدونمات المزروعة بأشجار الزيتون في جمعة الغضب نصرة لأسرانا البواسل . رام الله - وطن للانباء - وكالات - بعد جدار الفصل الذي يشقّ الأراضي الفلسطينية في الضفّة الغربية المحتلّة، قرّرت إسرائيل البدء ببناء جدار مشابه على الحدود مع لبنان غداً، وتحديداً في القاطع الفاصل بين مستوطنة المطلّة وبلدة كفركلا اللبنانية، وهو الأول من نوعه بين لبنان وإسرائيل، ويبلغ طوله كيلومتراً واحداً وبارتفاع يتراوح بين ستة وثمانية أمتار وسط تشديد لبناني على وجوب أن يكون مشرفاً على أعمال بناء الجدار، رافضاً انتهاك سيادته. جنين 29-2-2012 وفا- هدمت قوات الاحتلال الإسرائيلي، فجر اليوم الأربعاء، غرفة زراعية في قرية زبدة بمنطقة يعبد في محافظة جنين. وأفادت مصادر محلية أن الغرفة التي تعود ملكيتها للمزارع محمود جلال حمدان، تحتوي على معدات زراعية. وبينت هذه المصادر أن الغرفة المهدومة مقامة على أراضي متاخمة لجدار الفصل العنصري. بشار القريوتي – نابلس – قام أهالي قريوت بتنظيم فعاليات شعبية لمقاومة الاستيطان في قرية قريوت رفضاً للإجراءات الاستيطانية الغاشمة التي يقوم المستوطنين بالاعتداء على القرية بها باستمرار علماً أن قرية قريوت تعاني من إخطبوط استيطاني يلتهم أراضي القرية باستمرار ... حيث شارك أهالي قريوت والمتضامنين من كل المحافظات والقرى المجاورة. بيت لحم 19-1-2012 وفا-استولت سلطات الاحتلال الإسرائيلي على 76 دونما من أراضي قرية الخاص شرق بيت لحم، والمعزولة خلف الجدار العنصري المقام على أراضي المحافظة لصالح بلدية الاحتلال في القدس، بذريعة أنها أملاك غائبين. وقال رئيس مجلس القرية خضر حمدان لـ'وفا' اليوم الخميس: 'إن هذه الأراضي تعود لأهالي القرية الذين منعوا من الوصول إليها نتيجة إقامة الجدار وعزلها منذ العام 2007، لافتا إلى أنهم وعلى الفور سلموا أوراق القضية لمحامي وزارة شؤون الجدار والاستيطان لمتابعة واستئناف هذا القرار الجائر. بلعين: أصيب العشرات بالاختناق والتقيؤ الشديدين بعد قمع قوات الاحتلال للمسيرة الاسبوعية المناهضة لجدار الفصل العنصري والإستيطان، وقد أطلق جنود الاحتلال قنابل الغاز والرصاص المعدني المغلف بالمطاط باتجاه المتظاهرين كما رش جنود الاحتلال المياه العادمة الممزوجة بمواد كيماوية باتجاههم. وأكدت اللجنة الشعبية ضرورة توسيع المشاركة الشعبية في المسيرات المناهضة للاستيطان والجدار والطرق المغلقة والحواجز العسكرية، وأهمية تعزيز الوحدة الوطنية بين أبناء الشعب الفلسطيني لمواجهة سياسة الاحتلال والتهويد.